When attempting to characterize white matter lesions, important considerations include morphology and distribution, as well as patient demographics. The majority of cases represent nonspecific gliosis secondary to some form of parenchymal insult, typically microvascular ischemic, post-infectious and/or inflammatory, or traumatic in nature. Demyelinating processes, on the other hand, often occur in young adults, especially women, and demonstrate characteristic morphology and distribution, including involvement of the periventricular white matter, corpus callosum, optic pathways, posterior fossa structures, and spinal cord. The axial FLAIR image (above left) reveals multiple characteristic demyelinating lesions which are ovoid and oriented perpendicular to the ventricles along the perivenule spaces, referred to as Dawson fingers. 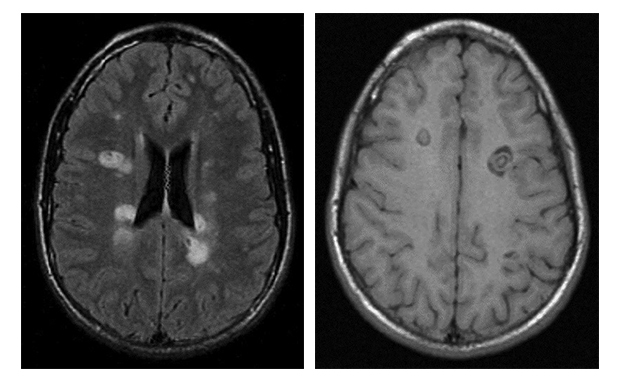 The T1 image (above right) shows pathognomonic findings of a subset of demyelination, Balo concentric sclerosis (BCS), which is characterized by concentric rings of alternating signal intensity which represent rings of demyelination (hypointensity) adjacent to rings of spared white matter (isointensity). BCS is a rare acute inflammatory demyelinating disease, classically considered to be a rapidly progressive and severe variant of multiple sclerosis. On MRI, BCS lesions are defined as two or more alternating bands of differing signal intensities. Lesions can be solitary or multiple and are typically without significant surrounding edema or mass effect. Enhancement can occur within the demyelinating rings, and – as with other demyelinating diseases – if present, is considered to represent active demyelination. Treatment of BCS is typically with steroids. If left untreated, many patients with BCS have aggressive disease. Recognizing the characteristic MRI pattern of BCS can aid in early diagnosis and treatment, ultimately improving prognosis. Gaffney S. At the Viewbox: Balo Concentric Sclerosis. J Am Osteopath Coll Radiol. 2013;2(3):30. Dr. Gaffney works in the Department of Radiology, Wilford Hall Ambulatory Surgical Center, Joint Base San Antonio-Lackland, TX.